Artist Ray Tatsumi has done an exhaustive in-depth study of Japanese maid outfits, tracing their origins from the UK and the USA. At the top right, you can see how maid outfits originate in the UK, but by the first part of the 20th century, they had branched off in the US and Japan. Japanese maids originally started wearing British style maid outfits in Western-style houses in Japan during the late 19th century, which then influenced Japanese domestic wear during the 1890s and on. But as you can see, however, the circa 1930s yellow-and-white outfit for the junkissa (純喫茶, meaning “pure cafe”), where just coffee was served, was derived from an American waitress outfit and not a British maid outfit. The circled junkissa outfit has a purple arrow pointing at it. That American style waitress outfit also influenced waitress outfits at Japanese train station cafes from the 1930s. In the above image, it’s circled and next to the junkissa outfit. According to Tatsumi, American diner waitress outfits (circled below, in burgundy) influenced Japanese “family restaurant waitress uniforms from the 1970s (above in the lime green section), and these then influenced PC game outfits from 1993 and on. 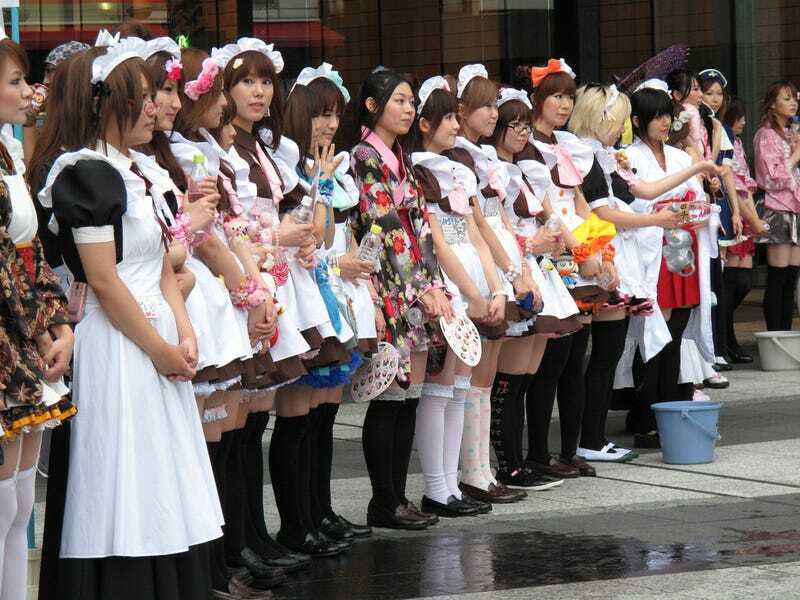 PC game outfits evolved and then influenced maid cosplay from 1999 and on as well as maid cafe uniforms from 2001 and on. Meaning? The origin of maid outfits might originally be British, but American waitress and dinner outfits were directly more influential. Interestingly, according to Tatsumi, maid outfits from Japanese adult PC games from 1985 and on were influenced by Japanese maid outfits from the late 19th century and by the French maid outfit, an American fetish design, which Tatsumi says evolved from the highly influential 1930s American-style waitress outfit. One standout part on Tatsumi’s chart is on the bottom right, where there are a white shirt and black slacks. This is the common cafe uniform now seen in Japan and, as Tatsumi notes, it’s designed for either men or women. Last December, Tatsumi released a self-published manga that detailed the development of Japanese maid outfits. Tatsumi is a member of Studio Ray, an adult PC game maker. For more on maids and maid illustrations, you can follow Tatsumi on Twitter right here.